Islam Around Us: Iraq officials: 2 vehicle bomb blasts kill 23. 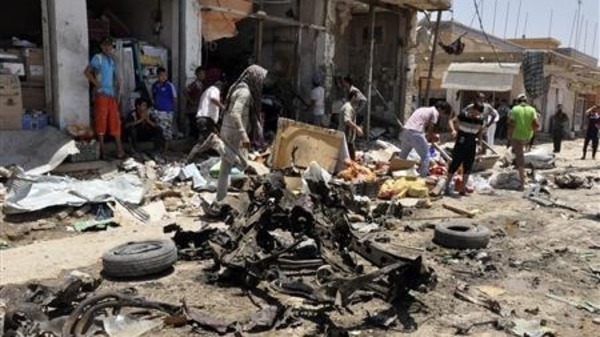 Baghdad | 30 Aug 2013 :: Iraqi officials say bomb blasts at a market north of Baghdad and another on the outskirts of the capital have killed 23 people. Police say the bigger explosion happened when a bomb hidden in a pickup truck hauling vegetables tore through a market in Samarrah, 95 kilometers (60 miles) north of Baghdad. Police say that blast killed 18 and wounded 32. Police say another car bomb went off in Abu Ghraib, on the western outskirts of Baghdad. They say it killed five and wounded eight. Hospital officials confirmed the casualty figures. All officials spoke on condition of anonymity because they weren’t authorized to release the information.